10/8/2014Share this story on Facebook! 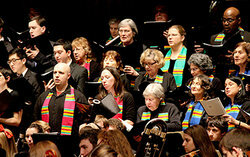 The VOICES Multicultural Chorus is a 100-member chorus that performs songs from ethnic choral traditions as a contribution to racial and cultural harmony within the Ithaca community. It includes IC students as well as members of the local community and performs at local schools, senior homes, and community sponsored events. As the house lights dimmed in Ford Hall, senior Condon ’14 crossed the stage to the podium amid sound of applause. Turning toward the orchestra, Condon raised his baton and swiftly conducted first downbeat of the overture. The familiar Walt Disney castle came into focus on a screen above the stage, quickly followed by images from well-known Disney movies, matching the familiar music being played by the orchestra. 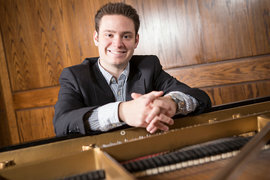 The concert, "Tale as Old as Time," was a culmination of four years of Condon’s work at Ithaca College and more than a year of intense planning. As a jazz studies major, Condon had often played in concerts, but this was the first time he was conducting one. Condon came up with the idea to put on a concert his junior year while driving back to Ithaca from fall break. He was listening to Disney music and began conducting the songs in his head, imagining how IC students would perform them. One immediate obstacle was raising the money to purchase the music rights. But over the summer, Condon used a crowdsourcing website to raise $3,290—more than double the original goal. They were able to use the money to rent the sheet music and market the concert. To make his ideas a reality, Condon brought together students, faculty, and community members. 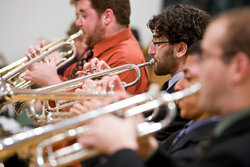 Baruch Whitehead, associate professor of music education, was the faculty advisor for the concert. Whitehead brought in the VOICES Multicultural Chorus, which he directs. The chorus helped with booking and tickets and performed in the concert. Music composition seniors Michael Samson ’14 and Ben Van De Water ’14 were the associate conductors, allowing Condon to also play the piano. More than 150 people played or sang in the concert. Some performers volunteered, while others auditioned for larger roles. When Disney characters had solos, they were portrayed by singers in character. Great care was taken to choose people who were able to channel their character’s voice and stage personality. Condon’s favorite part of the concert was the villain’s medley, which included a standout rendition of The Little Mermaid’s “Poor Unfortunate Souls” by Professor Susan Avery, M.M. '82. “Villains somehow have the best songs,” he said, laughing. As the concert date drew closer, performers worked diligently to ensure everything was in order. Rehearsals began in December, and the concert was finalized through seven rehearsals and a dress rehearsal, each lasting only two hours. All of the hard work and planning paid off. Nine days before the concert, Ford Hall was completely sold out—a rare feat in a venue with 739 seats. Kristine Tsui '16, a sophomore who worked on marketing for the concert, had attended a Skype session with Disney CEO and IC alumnus Bob Iger ’73 as part of S’Park, a survey course taken by all freshmen in the Roy H. Park School of Communications. She came up with the idea to reach out to Iger. He was thrilled to hear about the concert and offered to record a message. On the night of the performance, as the concert drew to a close, a video message from Iger appeared on the screen. In the video, Iger looked back fondly on his time at IC. “As you know, Disney is a place where magic happens and dreams come true, but it’s my sense that a lot of those dreams—like mine—got their start at Ithaca College,” he said. After graduating, Condon was hired by Norwegian Cruise Lines to direct the Broadway musical Rock of Ages and the dance show Burn the Floor on the Norwegian Breakaway. His six-month contract will run through the end of March, and Condon will apply to graduate school for the following fall.